To maintain smooth operation, an attractive finish, and to enhance the life of your Gliderol door, regularly wash the curtain with a sponge, soft cloth or soft bristle nylon brush and fresh, clean water. If this method does not remove all the dirt from the surface you may use a mild solution of pure soap or non-abrasive kitchen detergent and warm water. Please ensure you rinse the surface thoroughly, with clean water, to ensure all detergent is removed. In the case of Timber garage doors, if the sealer appears dull or starts to peel a refresher coat will keep the timber protected and the door looking like new. Any door that has been exposed to severe weather such as hail needs to be re-sealed immediately. Custom garage doors with aluminium frames and acrylic or prolycarbonate inserts should be regularly washed with fresh, clean water. If this method does not remove all the dirt from the surface use any non-corrosive/non-abrasive polycarbonate acrylic cleaner. Caution: Never use abrasive or solvent type cleaners like turpentine, petrol, kerosene or paint thinners to clean door surfaces as it may ruin the finish. Regular maintenance of your Gliderol Garage Door is necessary for smooth performance, good functionality and increasing the life of your door. 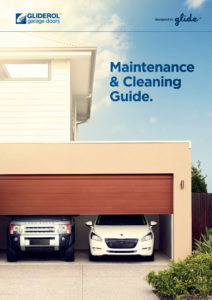 Remember, defective garage doors can represent a serious hazard. Regular door maintenance helps to prevent accidents and avoid unnecessary service bills. Conduct a visual inspection of mounting brackets, springs, tracks, guide lugs, fasteners, drive unit cables, weatherseals, etc. for any wear and tear at least once every six months. Roller Doors Only: Lubricate guide tracks twice a year, or as required, with silicone based lubricant only. Panel Doors Only: Panel Doors need oiling every 3–6 months and servicing every 2 years (more often for coastal properties). Motor oil (in an oiling can), RP7 or WD40 are all suitable for use. Apply oil to hinges, springs and wheel bearings only (refer owner’s manual). It is not necessary to spray the chain unless it appears to be rusted. In this instance apply oil sparingly and wipe off any excess with a rag. 1. Fully close the door. 2. If the door is operated electronically put it into manual operation (refer owner’s manual). 3. Lift the door manually to waist height, say one metre above the floor level. You should be able to lift the door with little effort and the door should stay open at that position. 4. If the door does not stay at that position (one metre) this implies the door is out of balance. Get the door balanced by a Gliderol authorised service agent. 1. Ensuring the door is properly balanced, as described above, fully open the door using handset. 2. Place a 20cm thick object, preferably wood, below the door. 3. Close the door when using a handset. 4. The door should auto reverse after striking the object (wood). If it doesn’t, call a Gliderol authorised service agent to fix the problem. If the door is fitted with additional safety devices like a photo electric beam sensor to prevent human entrapment please ensure it works properly.